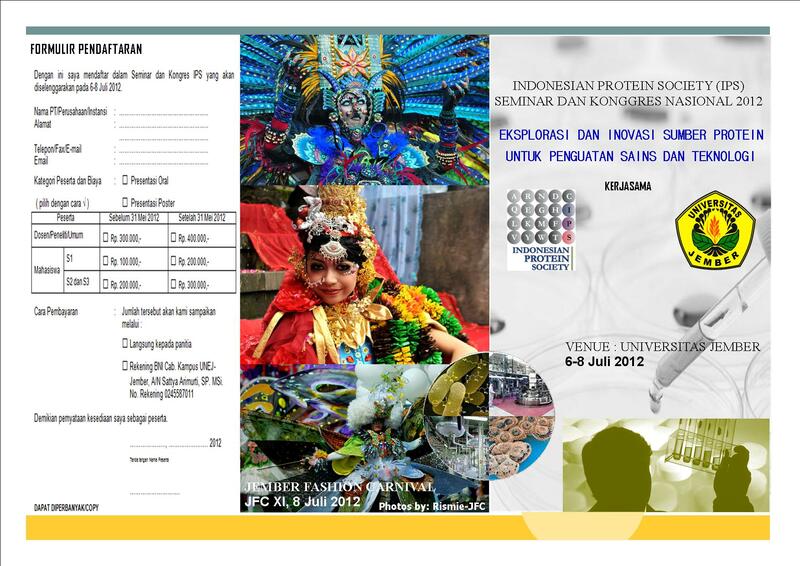 Indonesian Protein Society will hold its First Scientific Meeting at Jember city, East Java on July 6th to 8th, 2012. The first and second day will consist of presentations from invited speakers and participants, while the third day will be social tour which include watching the largest fashion carnaval in Indonesia, Jember Fashion Carnaval. To register please send email to panitiaips@unej.ac.id and panitiaips@yahoo.com. The first official circular (in Bahasa Indonesia) is as follow (released on February 14th, 2012). Laboratory demonstration, as well as biochemistry lecture, has been used to complement explanation of biochemical processes. 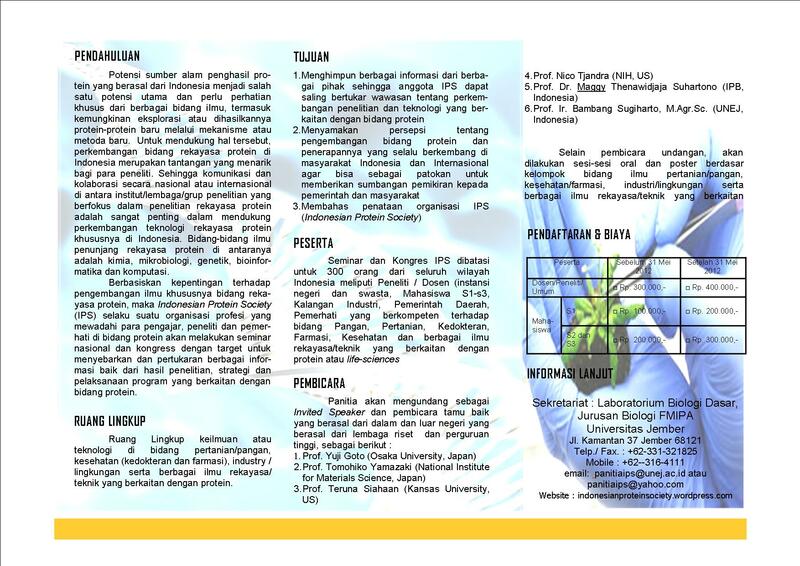 The laboratory demonstration is very useful in teaching biochemistry to students who lack background in biology. The experimental model of fibrinolysis described here presents a complex biological reaction in simplified manner, emphasizing specific terms related to enzymes, and triggers student interest in biochemistry. Problem statement: Bacteria from the surface of the tropical marine hard coral Acropora sp. were screened for producing raw-starch-degrading-á-amylase. Approach: Based on its 16s rDNA sequence, a bacterium that produced the highest amylolitic activity was identified as Bacillus amyloliquifaciens ABBD. The bacterial isolate secreted a á-amylase extracellularly and then the enzyme was partially purified by ammonium sulfate precipitation followed by anion exchange chromatography. Results: Electrophoresis results both SDS-PAGE and native PAGE suggested that the enzyme was a heterodimeric protein (97 kDa) consisting of 45 and 55 kDa subunits. The á-amylase had an optimum pH of 7.0 and temperature of 60°C. More than 80% activity of the enzyme was retained under high salt conditions (up to 20% NaCl). The enzyme remained stable at 50°C for 1 h. Starch hydrolysis by the enzyme at 70°C yielded oligosaccharides (G2-G4) and at room temperature yielded glucose/maltose (G1 and G2). Conclusion: The B. amyloliquifaciens ABBD á-amylase was capable of degrading various raw starch granules from corn, rice, cassava and sago at room temperature. An Indonesian marine bacterial isolate, which belongs to genus of Bacillus sp. based on 16S rDNA analysis and was identified as Bacillus filicolonicus according to its morphology and physiology, produced a raw starch degrading α-amylase. The partially purified α-amylase using a maize starch affinity method exhibited an optimum pH and temperature of 6.0 and 60°C, respectively. The enzyme retained 72% of its activity in the presence of 1.5 M NaCl. Scanning electron micrographs showed that the α-amylase was capable of degrading starch granules of rice and maize. This α-amylase from Bacillus sp. ALSHL3 was classified as a saccharifying enzyme since its major final degradation product was glucose, maltose, and maltotriose. Dessy Natalia, Keni Vidilaseris, Pasjan Satrimafitrah, Wangsa T. Ismaya, Purkan, Hjalmar Permentier, Guntur Fibriansah, Fernita Puspasari, Zeily Nurachman and Bauke W. Dijkstra, Soetijoso Soemitro. Glucoamylase from the yeast Saccharomycopsis fibuligera R64 (GLL1) has successfully been purified and characterized. The molecular mass of the enzyme was 56,583 Da as determined by mass spectrometry. The purified enzyme demonstrated optimum activity in the pH range of 5.6–6.4 and at 50°C. The activity of the enzyme was inhibited by acarbose with the IC50 value of 5 μM. GLL1 shares high amino acid sequence identity with GLU1 and GLA1, which are Saccharomycopsis fibuligera glucoamylases from the strains HUT7212 and KZ, respectively. The properties of GLL1, however, resemble that of GLU1. The elucidation of the primary structure of GLL1 contributes to the explanation of this finding.